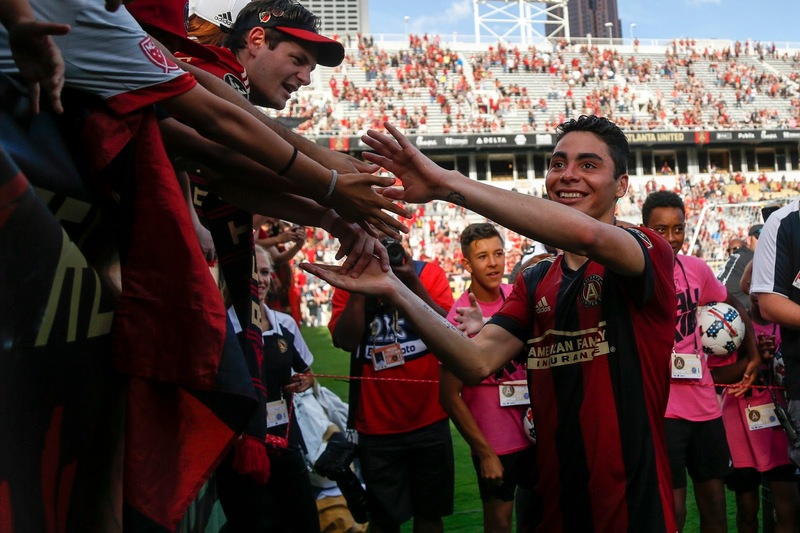 Miguel Almiron celebrates with Atlanta fans on Sunday night. USA Today Sports. Atlanta United, led by two goals from Miguel Almiron, beat New York City Football Club, 3-1, on Sunday night. Atlanta's three goals came within seven minutes in the first half. Their tactics of playing over the NYCFC press instead of through it started to pay off after the first ten minutes. In the 16th minute, Almiron got his first goal of the game, as he converted Julian Gressell’s low cross from the right, which NYCFC goalkeeper Sean Johnson had no chance to corral. Three minutes later, the Atlanta attack came from the left, as the dangerous Miguel Villalba was allowed too much time and space and the Argentinian cut into the box before curling a powerful shot past Johnson to make it 2-0 Atlanta in the 19th minute. Atlanta's third goal came in the 23rd minute and it came with a little controversy. NYCFC defender Alex Callens was chasing a long ball back toward goal when he seemed to have his heels clipped by the dangerous Julian Gressell, and it was missed by the referee. The German continued on and claimed his second assist of the game by setting up Almiron, who calmly swept the ball home from close in. NYCFC's lone goal came in the 71st minute when Ben Sweat set up Jack Harrison for his fifth goal of the season. The NYCFC players wore black armbands in respect of the victims of the Manchester attack a week ago. NYCFC has a tie to the city, as they are owned by Manchester City, along with the Yankees. New York City FC Head Coach Patrick Vieira said of the match, “The first goal we made a mistake because two players went for the ball and our recovery wasn’t good. When two players go for the ball and none of them win it, we create the space and become vulnerable. The second goal, a foul on Callens but the referee didn’t give it, if it was another referee he may give it. I think we put ourselves in a difficult position against the quality players they have on their team. Then when you concede a goal in 17 minutes, then 19 minutes and 25 minutes, it is difficult to for us to get something from the game." Vieira said of the atmosphere in Atlanta, which is in its first season in MLS, “It was fantastic. It makes it 12 on 11. They players respond to the atmosphere in the stadium." NYCFC dropped to 6-2-5, with 20 points, in third place in the Eastern Conference, while Atlanta improved to 5-3-4, with 18 points, and are in seventh place. NYCFC is back at Yankee Stadium on Wednesday night at 7:30 pm against the New England Revolution, and on Saturday at 1:00 pm against the Philadelphia Union.